2-way brass solenoid valves for car wash systems. Most types are Normally Closed (NC = open with voltage), Normally Open (NO) valves also exist and shut off when electrically powered. Solenoid valves operate direct or semi-direct (without pressure differential), or indirect (differential pressure required for proper operation). Brass is an alloy of copper and zinc, it is a durable material that is suitable for many media such as air or cold or hot water (no osmosis water). 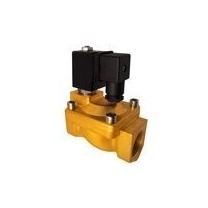 Most valves are available with either EPDM or FKM seals. For corrosive media, stainless steel is a better choice.